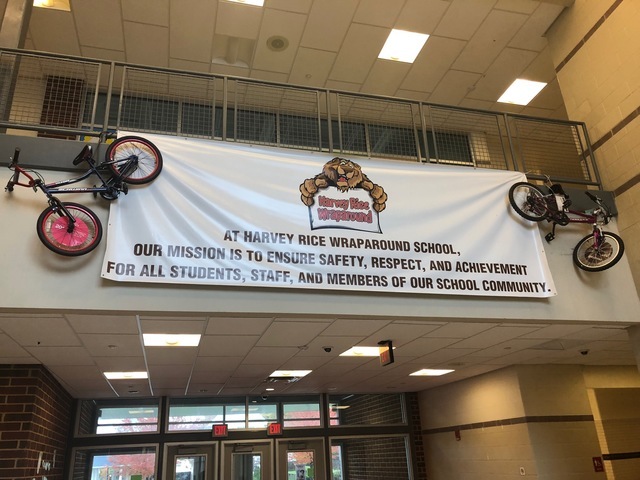 In the chaos of the first few minutes of school on a Monday morning at Harvey Rice Elementary School, not everyone is as excited as Principal Jason Tidmore Sr. This excitement is all part of a strategy by the school that focuses on the students' well being—everything from having food available to having free access to tutoring. "Good morning scholars!" he projects walking into a classroom. "At least let me see your eyes so I can see that you're alright," Tidmore says to a student who seems dejected in the hallway. 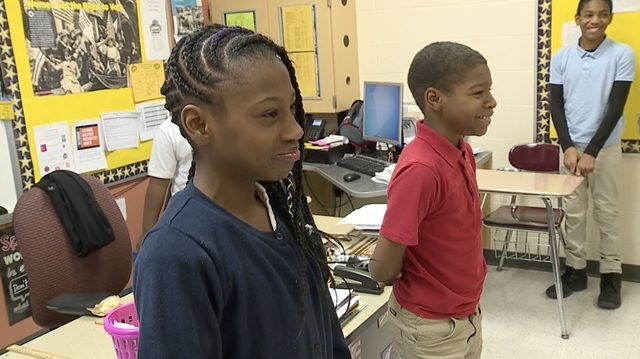 Two students lead their class' "Morning Meeting" where dancing, singing and positive messages redirect student's focus so they are ready to learn. This is Tidmore's second year as the principal, but the school's "Wraparound" strategy has been around for about five years. It's an approach where the school plays a roll in more than just academics. Tidmore says food is readily available for students in case they didn't get a chance to eat at home and community partners to work with the school to help families provide a stable environment away from the classroom. For example, families can get access to tutors for their students, and parents can take college-level classes for free. "When you think about wraparound, we invest in the whole child," said Tidmore. In a neighbored like Buckeye-Shaker, that level of engagement can go a long way. 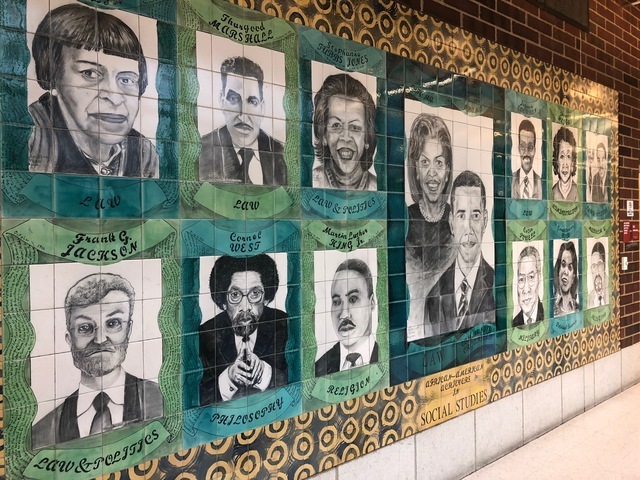 Part of a mural of a long mural in Harvey Rice's entry hallway right outside the school cafeteria. A Case Western Reserve University study found the area is a hotspot for crime, assaults and vacant buildings. All those are problems that impact students who walk through the door. Recently, a Cleveland Police Officer was shot near the 2600 block of East 121st Street during a weekend, just a few blocks from Harvey Rice Elementary School. The sign hanging in the entry hallway that Principal Tidmore says sums up the approach behind Wraparound. To fight back, classes have what are called "Morning Meetings, where dancing and singing is followed by positive messages for the day. Tidmore says it redirects students' attention from whatever happened before school, removing barriers to learning, with all the adults in the room fully participating. "Because they spend so much of their time here, we kind of have to address those other issues," said Tidmore. 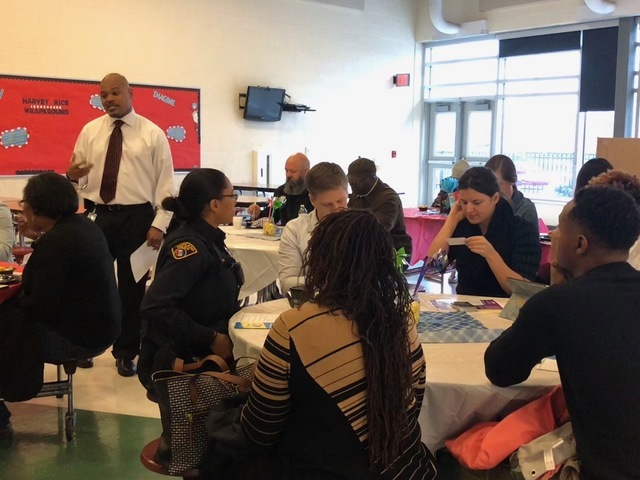 "A strategy is strategic in that it accesses a need and then you address that need," said Centers for Families and Children Director of Family and Community Engagement Tanese Horton. Horton helped create the Wraparound strategy about five years ago. "If you don't have that village, you're kind of lost," said Shirley Patterson. Patterson's children, and now grandchildren, have all gone to Harvey Rice and the family got connected to tutors through the Wraparound approach. "It builds up their reading and their math skills," said Patterson. Tidmore speaks to parents and community partners during "Chat 'N' Chew," where families can connect with services outside the school building. Patterson says she's lived in the area for decades, and it's exactly the approach her community needs. "It gives you all helpful information for your family to build a family," said Patterson. "And this school is like a family." The Cleveland Metropolitan School District different variations on the same program in a number of its other schools. Tidmore tells News 5 that Harvey Rice has integrated this program for all of their students all the time.